At System Simulation, we pride ourselves on the breadth of our capabilities and so we were very excited to take on the presentational and technical challenges involved in delivering the interpretation systems for the remodelled Croydon Clocktower Museum. The project launched successfully, to schedule, in September 2006. Firstly, we were required to deploy our practical experience, including our particular skill in integrating diverse systems, to deliver the technical infrastructure. Then our design flair came into play, to allow the museum to present its material with real impact. Interpretation of the objects, displayed in six gallery spaces throughout the new Clocktower Museum, is presented on over thirty interactive kiosks running thirty unique programmes. 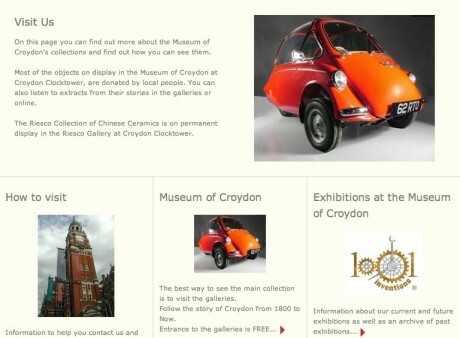 Each provides layers of detailed information about the objects and their relevance to the local community. Further information and the opportunity for visitors and the wider public to give their feedback (personal stories, reminiscences, etc) are delivered through parallel web systems. These are available to visitors within the museum's Memory Room and to the public through the website. Both delivery platforms draw on both new material written specifically for this purpose, including selected feedback from the public, and material drawn from a third party collections management system. ContentIndex+, our Content Management System, provides the backbone for the technical solution. ContentIndex+ was developed with the culture sector's growing need for publishing to multiple outlets very much in mind. The system is highly supportive of the creation and presentation of imaginative content. We worked with museum staff to provide a truly engaging display that complements the overall design of the galleries. The result is an evocative experience, creating a real sense of place.